Do you wish that you could get more done? If you are anything like me you will feel you are busy all day then find you have accomplished very little. You have spent hours on very small tasks and that big assignment is still waiting to be done. We all have that one colleague who is a whiz in the office and can get everything done on time. Well I'll let you in on a secret, they aren't super human. They just know a productivity hack or 5. Every day after working on my blog I would look back on what I’d achieved and I was always disappointed. How could I have been busy doing nothing for 8 hours. Something had to change if I wanted this blog to be a success. I began to look into ways to improve my productivity and time management. I tried everything! 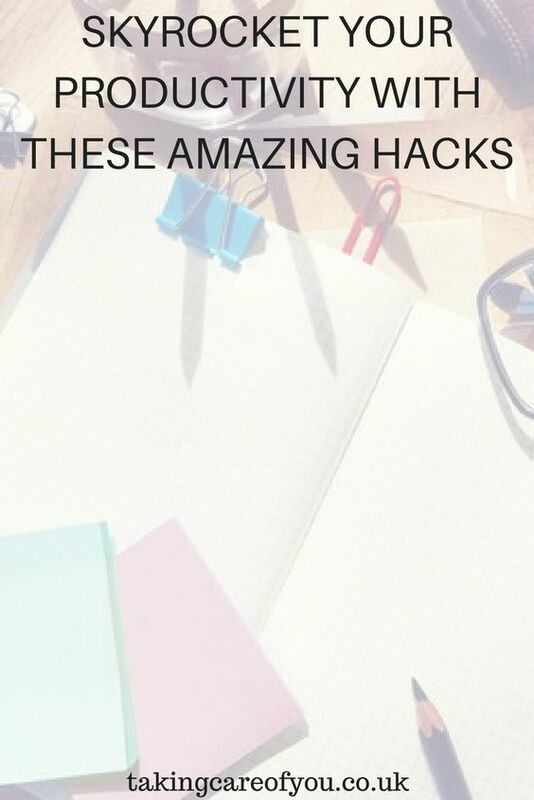 Below is a list of 9 productivity hacks that worked for me. Once I began to follow these tips my productivity tripled and I actually started to see results from my blog. 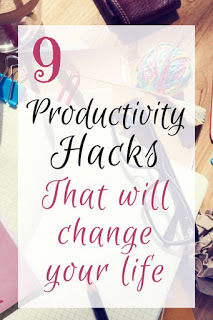 9 Productivity Hacks That Will Change Your Life. Look after yourself. You are never going to produce your best work if you don’t feel your best. Get plenty of sleep, eat healthily and drink lots of water throughout the day. Try to get a small amount of exercise each day and take regular breaks. Remove digital distractions. This is super important. Turn off all notifications on your computer, emails, Facebook and twitter alerts. We may have good intentions but when that alert is right in front your face even the most self controlled person would be tempted. The same applies with your phone. Although I try to go a step further and leave mine in a different room. I know the temptation to pick it up will be too great. Saving all those notifications up gives you something to do on your break. Organise your workspace. If your office and desk are messy, cluttered and disorganised you are much more likely to waste time looking for things. Take the time to organise your workspace properly, so that appropriate items are stored together and everything can be easily found. Once this is done ensure that the space is kept tidy and uncluttered and that everything stays where it should be. The Pomodoro technique. This technique works extremely well for me and is great for keeping you focused. The idea is to divide each task into 25 minute sections, between each section you get a 5 minute break. After completing 4 sections you get a 20 minute break. The most important thing to remember is to use a ticking clock to time your segments as the sound really helps with focus. If you find that your productivity does not improve immediately, don’t worry. The key is in repeated use. You will soon find your productivity and your focus improving. The 2 minute rule. This one is pretty simple, if a task can be done in 2 minutes or less then deal with it immediately. Do not schedule it for later, which means that quick phone calls and emails do not stack up waiting for you to tackle them. Schedule tasks. I used to love writing todo lists. The only thing is I would pick and choose what I wanted to do. There’s was always 1 or 2 things that never got done. The best way to deal with this is to schedule each task for a specific time in a planner. Then just work your way through. I use a daily planner very much like this one Scheduling ensures that every task gets done. Lists are no good, you have to plan. Eat your sprouts firsts. Or in other words, start with your least favourite tasks. If you can cross these off your list first thing. Your day will go much smoother and you will be much more productive. Batch your tasks. Batching similar tasks together means you will be the same frame of mind when dealing with each of these tasks. Schedule these tasks together when planning your work. Your day will run much more smoothly. Learn how to say no. Some people (including myself) find it really difficult to say no. It is so important that you do not take on too much. This will cause you to be overwhelmed and affect your productivity. Sometimes, for the sake of the work you already have you just have to tell people no. I try to be as polite as possible and tell them I’m busy at that time but I will let them know if I’m free to help later. 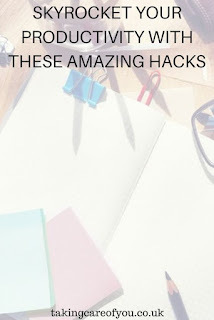 These hacks have dramatically increased my productivity and the good news is they are all easy to implement. Do the quick tasks immediately. Ditch the lists and have a plan. Get your least favourite tasks done first. Batching is the way forward. Be tough and say no. Have you tried any of these techniques? How did you get on? This post may contain affiliate links. I would never recommend products I don’t love, use, or wish to buy. Love this post! I just started trying out the Pomodoro technique and it just made me realize how easily distracted I am from tasks I am trying to do by other tasks. Either way, awesome blog post. I've been really enjoying your content! Hi, thank you so much. I’m the most distracted person on the planet and these tips have really helped me. I have a full time job as well as my blog and the Pomodoro technique has been a life saver! I love this and I am going to try it immediately. Thanks.